You probably have seen this blue logo. and you probably know that means Energy Saving Appliance, which usually means that it costs a little more in the short term and a lot less in the long term. You know, the air conditioner costs $40 more, but it uses less energy every month, so you pay less on your electric bill. And it's usually worth it. This is all true, of course, although it's getting so that more and more products are energy star, and so the price differential is getting smaller and smaller. Which makes it EVEN more worth it. The last time I shopped for an air conditioner, I think there was a $10 difference in price between Energy Star and Non. What you probably don't know that the Energy Star Program started only 20 years ago, and that the EPA (administrator of the program) estimates that as of 2012 ENERGY STAR products prevent more than 150 million metric tons of greenhouse gas emissions annually. That's PER YEAR! Also, more than 200 billion kilowatt- hours (kWh) of electricity is saved per year, which represents 15 percent of U.S. residential electricity use. These savings have offset the need for more than 185 additional power plants. This data is from the 20 years EPA milestone book(pdf) available on their website. I defy you to find a better government program. The Environmental Protection Agency has got a new initative to get kids and families on board to help protect the climate through easy-to-implement, money-saving actions and provides them an outlet for sharing their passion for preserving our environment. The initiative is called TEAM ENERGYSTARTo help with this, ENERGY STAR has partnered with PTO Today and LG Electronics USA, to create TEAM ENERGYSTAR and brought in the heroic characters from the new movie EPIC to help kids learn about the importance of saving energy while having fun at the same time. There they can sign up and take a pledge for energy efficiency. Team ENERGY STAR will give them plenty of practical energy saving ideas right there on the pledge page. 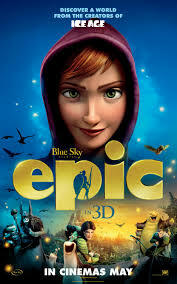 The first 250 families to pledge will receive a free DVD of EPIC the movie! At the site they can download EPIC-themed educational activities and games on saving energy and protecting the climate. After submitting their pledge, families can enter the “Most EPIC Player” contest by sharing the site through Facebook or Twitter. The 25 entrants who get the most likes and/or retweets will win prizes from LG: computer monitors, TVs, smart phones and MP3 docking stations. The top 5 winners will get featured on LG’s NYC Times Square billboard! So, save yourself some loot, win some prizes, and have some fun, and maybe get 15 minutes of fame. Oh yeah, and help save the environment in the process. What could be better than that? DISCLOSURE: This is a SPONSORED POST. I haven't actually been paid to write about this, but I might win a random TV. My opinion of Energystar is NOT influenced by the potential of winning a random TV. Every appliance in my home is already EnergyStar. UPDATE: Great video from DadLabs about old school and new school dads and Energy Saving. Dad-Labs co-founder Clay Nichols does his best Alec Guinneess impression, and plays both the old school and the new school dad. Lots of fun!